Denver? Chicago? Lincoln? It doesn't matter where you go. You're going to get the same great service. It was the Sunday night before Thanksgiving; Mark Tucker, Director of Aviation and Chief Pilot for WC Aviation, LLC was flying into Centennial Airport (APA) in Denver, CO, with his company’s Falcon 50 aircraft. The Honeywell TFE731 engines were scheduled for major overhaul and a team of Duncan Aviation Engine Rapid Response (RRT) Technicians were waiting for him to land to get started on the triple R&R. The event required a tight turn-time due to the approaching holiday and an international trip scheduled to leave on that Thursday. The aircraft was already several hours behind schedule. When Mark landed, he expected to be met with grumblings and frustration. But what he got was a team of men who shook his hand, introduced themselves, and went to work. Mark left and went to dinner with the team still hard at work. When he returned at 9 pm, they had two of the three engines off. Within 36 hours, the aircraft was returned to service and ready to fly. Mark was very impressed with the amount of work done in a short period of time with such professionalism. And what made this even more impressive to Mark was that this Duncan Aviation RRT team had not worked together before, but performed as if they had been together for years. They knew what needed to be done, who was responsible for what, and was in constant communication with each other to keep things moving forward. Only Brian Weathers and Eric Hanson were local from the APA shop. Aaron Hutton and Taurean Midgett work out of the Duncan Aviation RRT shops in Northeast area, and Kevin Watrus was brought in from Seattle. Tyler Spurling, Engine Line Team Leader from Lincoln, Nebraska. This second team included Tyler Spurling, Rustin McCullough and Warren Wiatrek all from Lincoln, NE. Joining them was Kris Werth out of the Chicago RRT shop. To meet the teams who worked on this project, read the rest of the story in the Spring 2017 Duncan Debrief. Duncan Aviation recognizes the crucial role trust plays in all relationships, but most particularly in working relationships. Regardless of whether those relationships are among co-workers or between Duncan Aviation’s team members and customers, trust is the foundation upon which the business was built. “I’ve been at Coca-Cola for 33 years and have done business with Duncan Aviation since 1984. 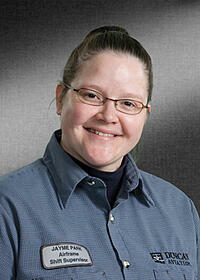 I have a great rapport with Sharon Klose (a turbine engine service sales rep). I trust what she says and feel she’s completely honest with me. Because of that, I can be completely honest with her, too. One time, she taught me a valuable lesson: Your word is only as good as what you say. "In the 13 years I've been with Oakmont Corporation, I've always brought our aircraft to Duncan Aviation, and the No. 1 reason is the people. The character of the people who work on our make/model and their level of experience instills trust far beyond comfort. They have an unmatched knowledge base due to their many years of experience working on our make/model of aircraft." To read more about about our customer relationships, view the Spring 2015 Duncan Debrief. What's At The Core of A Duncan Aviation Customer Relationship? The late Stephen R. Covey, author, motivational speaker and business professor, said: Trust is the glue of life. It’s the most essential ingredient in effective communication. It’s the foundational principle that holds all relationships. 94 new customers in January 2015. Tha'ts a lot of trust. Duncan Aviation Project Manager Tammie Burns knows that building relationships with customers is the best way to earn trust and confidence. Many of her customers are from Mexico and are not familiar with Lincoln, Nebraska, at all. Often, too, the project manager is the only point of contact for many customers. One Saturday before Christmas, several of Tammie’s customers from Mexico had gone to the Nebraska outlet mall store located between Lincoln and Omaha. While there, they accidentally locked the keys in the trunk. The rental agreement and all of the insurance information were locked inside the car. Tammie was one of a handful of people they knew in the area, so they called her. She made a few phone calls to find out which rental company they had gone through and what insurance coverage they had, and she called the car rental company. A representative for the rental company took the stranded shoppers a new car so they could drive back to Lincoln, and he waited at the mall for a locksmith. Lincoln Customer Service Manager Monte Reeves says there’s no magic formula for building trust and confidence. In 2006, Vice President of Marketing and New Business Development Steve Gade proposed having customer dinners every other week at local restaurants in Lincoln and Battle Creek as a way to relax with our customers outside of work and to let customers meet and visit with one another. Carlos Martinez Canchola, powerplant engineer for Aerolineas Ejecutivas, in Toluca, Mexico, was at Duncan Aviation’s Lincoln facility with his company’s Learjet during a frigid February that produced a stretch of single-digit temperatures. In an effort to build relationships, encourage open communication and foster the trust and confidence of our customers, Duncan Aviation also established a Customer Advisory Board (CAB) in 2004. “Listening to our customers is critical to our continued success. We convened the first Customer Advisory Board to help us accomplish our mission of continuous improvement and customer-centered innovation,” says Jeannine Falter, vice president of business development. By working with boards in Europe, Latin America and the United States, Duncan Aviation hopes to tap into the insightful perspectives of the various members to gain a clearer understanding of business aviation and customers’ expectations around the world. Tim Ganse, aviation manager at Cimarex Energy Company in Englewood, Colorado, has been a member of the Duncan Aviation CAB for two years. By fostering opportunities to communicate with customers in as many settings as possible, Duncan Aviation hopes to keep the level of trust high. That, in turn, helps build the foundations of long-lasting business and personal relationships. Read more Duncan Aviation customer stories in the Spring 2015 Duncan Debrief. In the seven years Technical Manager (Director of Maintenance) Klaus Rasmussen has worked for Denmark-based Air Alsie, he’s traveled to Duncan Aviation in Battle Creek, Michigan, many times. Learn why he continues to fly the more than 6,500 kilometers for aircraft service. Of the 20 aircraft Air Alsie manages, 15 of them are Falcons. Although Air Alsie is a factory authorized Dassault Line Center and performs smaller inspections, minor repairs and warranty claims, Klaus says he still sends the Falcon aircraft he manages to Battle Creek for major structural repairs and modifications and for C inspections because Duncan Aviation is a Dassault authorized heavy service center. In 2011, Klaus attended the European Business Aviation Convention & Exhibition (EBACE) in Geneva, Switzerland, where he met Duncan Aviation’s European Regional Manager Arjen Groeneveld. Klaus remembers wondering how Duncan Aviation’s prices compared to the European service centers. Arjen quoted three C checks, some avionics installations and minor modifications. Klaus was impressed with the prices, and after taking those first Falcons to Battle Creek in 2011, he was also pleased with the workmanship. “On that first trip to Battle Creek in 2011, we were checking out the quality. We’ve been to other facilities for inspections and interior work. In the end, our decision was based on the fact that we’ll get good quality at better prices at Duncan Aviation than at the other facilities,” says Klaus. Another reason Klaus values Duncan Aviation is because of the transparent approval system. Duncan Aviation’s online project tracking system, myDuncan, lets him follow the check almost in real-time, and, when the work has been completed, all of the paperwork is finalized immediately. L to R: Project Manager Shawn Busby, Technical Manager of Air Aisle Klaus Rasmussen and Airframe Service Rep Alan Monk. Since that first trip, Klaus has been back to Battle Creek numerous times, and he’s developed close relationships with Senior Airframe Sales Representative Alan Monk and Project Manager Shawn Busby. Often work relationships develop into close personal friendships, and Alan considers Klaus a friend as well as a customer. “We both have families, and Klaus and I often talk about our kids. It’s interesting because parents seem to face similar issues no matter what part of the world they call home,” says Alan. Shawn also values the close, personal relationship he has with Klaus. “Personally, I consider Klaus as much of a friend as I do a customer. I enjoy hearing about his daughters, what they’re doing, and their horseback riding adventures,” says Shawn. Read more Duncan Aviaton's customer in the latest issue of the Duncan Debrief. Is Flying to Duncan Aviation Worth the Trip For European customers? Arjen Groeneveld has been the European Regional Manager for Duncan Aviation for five years. When he first started knocking on doors and talking about the company to European operators, he was met with… “What is it going to cost me?” This came as no surprise to him, because Europe was a relatively new market for Duncan Aviation. They wanted to know why they should fly their aircraft to the other side of the pond to have service performed. In the beginning, Arjen admits that the euro to dollar exchange rate (near 1.5) in 2011 had a huge impact on getting business in the door. Customers like Nataly and Ernst Langer, owners and pilots of a Bombardier Global 5000 out of Germany and Klaus Rasmussen, technical manager of Denmark-based Air Alsie, were among the many European operators who took advantage of this economic benefit and gave Duncan Aviation a try. What they found was a company that offered comprehensive airframe services at the highest quality and shortest downtime. Arjen Groeneveld, European Regional Manager. Now in 2015, euro to dollar exchange rate has dropped significantly. But that hasn’t stopped international operators from making the journey. Business aviation operators in Europe are a small group and they talk to each other. As a result, Duncan Aviation’s reputation as a company that delivers top quality service at a great value, quick downtime and always worth the trip has spread. “We have customers who fly from Europe to have maintenance completed at one of Duncan Aviation's United States locations,” says Arjen. “The fact that they're willing to make that trip tells us we're doing something right. We have customers who fly from Europe to have maintenance completed at one of Duncan Aviation's United States locations. The fact that they're willing to make that trip tells us we're doing something right; their words tell us exactly what we're doing that makes the flight worth it. Nataly and Ernst Langer are owners and pilots of a large, long-range business jet. Watch and listen all about their incredible paint scheme application. "Cost control is made easy by the use of Duncan Aviation’s web-based approval system, myDuncan.aero. Milestones can be followed, even if an operator is not on-site. I haven’t seen any other MRO with such a system. 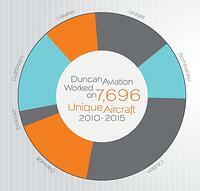 "Duncan Aviation’s state of the art facilities and dedicated experts offer unique service. We receive very good support from Arjen Groeneveld, Duncan Aviation representative in Europe and we appreciate having a dedicated Project Manager with each event. "Working with Duncan Aviation is a real pleasure. At Sporavia we feel that it is important to give operators consistent quality, no matter where they are flying or where they are going to maintain their airplanes. Duncan Aviation holds those same values and so we look forward to working closely with them in the future. "We enjoy working with Duncan Aviation because their team is well educated and we always receive professional and competent support. We look forward to working with Duncan Aviation on more projects in the future. "The friendly and competent sales and support teams at Duncan Aviation are appreciated by our logistics department. Duncan Aviation’s availability of spare aircraft parts and knowledge in international shipments provides us excellent support. "Extensive projects involving engineering support from Duncan Aviation are handled professionally and there is always a solution oriented team from Duncan Aviation available for answering our questions." "Duncan Aviation’s customer base extends far beyond what I can reach in Germany. They have the opportunity and ability to sell parts that we cannot. Through Duncan Aviation’s consignment program, operators have a chance to profit from items that they would otherwise consider scrap. I could not have generated this money in sales in Europe. After many years, I find Duncan Aviation to be an excellent partner, serious and fair with everything. Take your surplus inventory, put it in a box and send it to Duncan Aviation today!" Duncan Aviation’s Regional Managers are strategically located across the world to better support our customers. Each travel throughout their region, meeting with aircraft operators, management organizations and other service providers with the goal of maintaining and building lasting relationships, providing customer service, educating operators and learning more about the region’s regulatory issues and processes while engaging in industry forums. Get to know the Regional Manager for your region now. "It doesn't matter when I call...late at night or over the weekend, Duncan Aviation has a bunch of people who really care…." Jad Donaldson, Chief Pilot for Avfuel. Jad Donaldson, chief pilot for Avfuel Corporation, along with Co-Captain Chris Kosin, flew the company’s Citation XLS+ from Ann Arbor, Michigan, to Harbor Springs last July. As they prepped the Citation for the flight back to Ann Arbor, they saw a yellow Crew Alerting System (CAS) message, stating LH ENGINE CONTROL FAULT (ECF). After discussing the CAS message, they shut down the entire aircraft, including powering off and pulling the battery. When they restarted the battery switch, 45 seconds in, the ECF message appeared again. Reviewing the Aircraft Checklist delivered unwelcome news: The message required correction before flight. Jad also retrieved maintenance pages, reviewed the fault codes and analyzed the TLA maintenance screen. “We were AOG,” says Jad, “so I immediately called Jayme Park, the Airframe Alternate-Shift Supervisor at Duncan Aviation in Battle Creek, who has spent the last 17 years helping Duncan Aviation customers resolve their maintenance issues. Bill Walker, Engine Tech Rep in Battle Creek, was confident that the codes indicated a multiple-level power supply failure on the motherboard in the engine computer. Jayme Park, Airframe Alternate-Shift Supervisor at Duncan Aviation in Battle Creek. Jad called Co-Captain Jeff Squires to prep Avfuel’s second aircraft. Jeff flew from Ann Arbor to Battle Creek to pick up Aaron LaClair, a Duncan Aviation Engine Tech, on to Muskegon to get the new EEC and then to Harbor Springs.Within 15 minutes, Jayme had located the necessary EEC and set about gathering and processing the necessary paperwork to prepare the aircraft for eventual signoff and return to service. Five and a half hours after Jad received the error code, Aaron was on the ramp, downloading the data from the Citation’s left-hand engine’s DCU. That perseverance paid off. Around 2 a.m., Aaron and Jad pulled the functioning right-hand EEC, swapped it into the left-hand engine, and put the new part in the right-hand engine. By 3:45 a.m., when Jad brought the Citation back online, the onboard maintenance diagnostics returned no error codes, the TLD screen showed an N for both engines, and the channel assignments were normal. The aircraft was no longer AOG, and there was still a little time to get back to the hotel and get some sleep before the day of shuttling passengers began. Jad says, "We at Avfuel are fortunate to have access to technicians like Jayme Park. Jayme jumped in and used her leverage, intelligence and experience to get this issue resolved. I'm also fortunate to have the relationship I do with Duncan Aviation—it's like having my very own maintenance team. It doesn't matter when I call, either; whether it's late at night or over the weekend, Duncan Aviation has a bunch of people who really care… people like Jayme who are passionate about what they do and do everything they have to do to take care of their customers." You read more details about this story in the Spring 2014 Duncan Debrief. 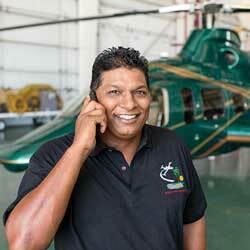 "My customers continue to return to me for service because I turn to Duncan Aviation. They've never let me down." If you’ve ever had to hunt for a specific aircraft part, component or avionics unit, you are well aware of how difficult it is to do a thorough research, locate a reputable supplier, negotiate pricing and schedule delivery. Most of the time, you are under a strict time constraints and need the aircraft part or avionics unit now and you don’t want to deal with all the issues that can complicate the process along the way; issues, such as no available inventory, managing billbacks, no traceability documents and lack of warranty support. Kassim Khan, co-owner of Aviation Parts & Supply, an aviation parts broker supporting several corporate flight departments, has relied solely upon Duncan Aviation for 18 years to provide the parts needed to serve their customers. “The bottom line is that Duncan Aviation has never let us down,” says Khan. Read Aircraft Parts on Speed Dial on page 29 of the Fall 2013 issue of Duncan Debrief and find out why Kassim has only one number in his phone when it comes to finding aircraft parts. Duncan Aviation maintains a large inventory of aircraft parts for sale. Our streamlined services and competitive turntimes satisfy hundreds of requests throughout the world 24 hours a day, 7 seven days a week. Our many awards testify to the quality of our service. Brad Sides is a 12-year Duncan Aviation veteran, leading by example by delivering what is required to meet a customer's expectation. "It's all in a day's work." In late March, a customer contacted Duncan Aviation for off-site assistance with a nose wheel steering malfunction. This customer sent the following letter to Allen Sward, Duncan Aviation Airframe Team Leader, regarding the experience. We decided to share these remarks because although we can say we hold ourselves to a higher standard of service than other service providers in business aviation, nothing says it quite like our customers do. The customer's name and company have been removed at his request. On March 28, 2012, our C680 had a Nose Wheel Steering malfunction in Nebraska City, NE. Our in-house maintenance department contacted Duncan Aviation in Lincoln. Your maintenance technician, Brad Sides was assigned the task of repairing our aircraft remotely. Brad made the drive down to AFK immediately and began the work required. He worked non-stop until late that evening, and then returned again the following morning to complete the repair which allowed us to ferry the aircraft to LNK for the functional tests required. 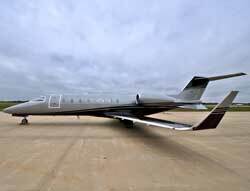 I have been in corporate aviation for 21 years and have experienced maintenance at many other service facilities. Duncan Aviation and Brad Sides made this maintenance event the best I have ever experienced. He was there when we were told he would be. He stayed until late to get the part off of the aircraft for repairs. He coordinated with Lincoln to move the part back to the shop quickly. He was very pleasant, friendly, and professional. He explained everything easily and kept me informed on the process. His expert skills speak for themselves. They obviously have people who know their job. All of the employees seem to work very well together communicating and closing the gaps. Everyone involved in the maintenance was friendly and professional. The front desk staff was very helpful, friendly, and professional. The best part.......we were out of there when Duncan said we would be! Thanks again for making this event as pleasurable as possible. Brad Sides, Duncan Aviation Lead Mechanic from Lincoln, NE, believes one of the most important parts of his job is to deliver exactly what the customer expects, but strives to deliver more. "This customer came to Duncan Aviation expecting the best. That's the level of service that I want to provide." 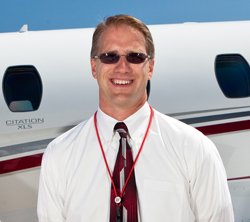 Brad is a 12-year Duncan Aviation veteran, his aviation career began in 1998. Duncan Aviation offers emergency AOG services and 24/7 troubleshooting for grounded aircraft in your hangar or around the world, with remote AOG engine Rapid Response teams based at several strategic locations across the United States. All AOG teams that respond are equipped with the resources necessary for most aircraft and engine emergencies, and are supported by Duncan Aviation's two full-service facilities and network of avionics satellite repair stations. Duncan Aviation’s mobile app is available for download on iPads®, and makes it easier to contact service locations, service representatives and department listings.